South Kern Sol will hold a press conference at the Brower Building’s Conference Room on Wednesday July 9, to introduce the inaugural issue of our community wellness print publication. Three years ago, New America Media, with financial support from The California Endowment, launched South Kern Sol, a youth-led community news website dedicated to engaging local young people in journalism, amplifying the voices of South Kern residents, and shining a light on the health disparities that exist in our communities. 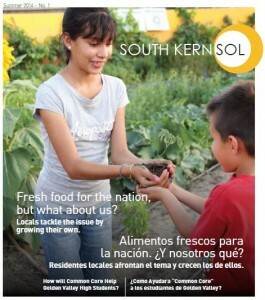 Although created primarily by youth and young adults, South Kern Sol is a platform intended for the entire community. In this first issue, we decided to tackle the issue of fresh food access for our residents, despite the fact that we live in the heart of California’s rich farmlands: Two youth tell us about their experience living as vegans; and in another story, we learn how a group of South Kern residents have learned about the difference in the quality of food that a community garden can bring. We also explore the topic of being young and undocumented, and explore the local impact of sweeping changes to our state’s education system. Also, local veteran reporter Leonel Martinez contributes an exclusive column on the changing face of faith in our community.